China-based Wuhan Sanjiang sees new U.S. Treasury sanctions. Wuhan Sanjiang’s role in North Korea’s ballistic missile program has been well-known for some time now. The firm’s Wuhan Sanjiang Wanshan 51200 (WS51200) eight-axle heavy lumber trucks, at least six of which are known to have been transferred to North Korea in 2011 under false pretenses, were seen carrying mocked-up KN08/Hwasong-13 intercontinental-range ballistic missiles in 2012. The trucks had been converted to carry heavy ballistic missiles in a transporter-erector-launcher configuration. Since then, the WS51200’s role in North Korea’s ballistic missile programs has only become more important. 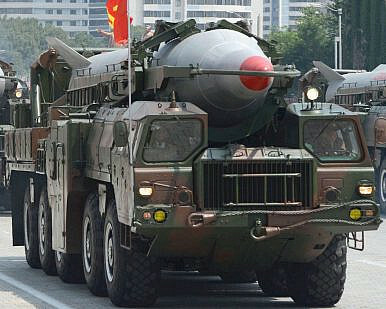 This year, the July 4 and July 28 launches of North Korea’s new KN20/Hwasong-14 intercontinental-range ballistic missile (ICBM) were also carried out using converted WS51200 trucks, which operated as transporter-erectors. The missile launches used a separate static firing table — a measure taken by North Korea to presumably avoid exposing its small inventory of heavy trucks to potential damage from a missile launch gone awry. The WS51200 trucks were additionally seen at North Korea’s military parade on April 15, 2017. Four of the trucks had been modified in a previous unseen configuration, resembling a Russian Topol-style canisterized road-mobile ICBM launcher. North Korea is not thought to currently possess a ballistic missile suitable for operation with that style of launcher, but the larger ICBM-sized canister was seen as a statement of ambition for North Korea’s ballistic missile program, which may soon transition toward more survivable and use-ready solid-fuel missile systems. As I’d discussed in these pages in July, North Korea also released previously unseen images of the WS51200 truck in its manufacturer’s paint scheme. The photograph, released during a celebration concert for its first successful ICBM launch, showed former North Korean leader Kim Jong-il standing near a red WS51200 truck with what appeared to be a prototype KN08 missile atop it. The WS51200 trucks appear to have been exported to North Korea without the Chinese government’s knowledge of their ultimate use. Chinese officials reportedly explained as early as 2012 — following the first appearance of the truck with a ballistic missile atop it — that North Korea had claimed the trucks would be used for logging activities. The UN Panel of Experts on North Korea, in its 2013 final report, identified Wuhan Sanjiang as the entity responsible for transferring the trucks to an unidentified “non-governmental” entity, which turned out to be North Korea. The designation of Wuhan Sanjiang on Friday also alluded to its involvement with the Iranian firm Shiraz Electronics Industries, which had itself been designated under Executive Order 13382 in 2008. “Since at least 2014, Wuhan Sanjiang has entered into contracts to sell SEI navigation-related gyrocompasses valued at hundreds of thousands of dollars. Wuhan Sanjiang has sold SEI a variety of highly specialized sensors valued at nearly one million dollars, and has taken steps to obfuscate those transactions to avoid detection,” a U.S. Treasury release noted. Gen. Joseph Dunford recommends that the U.S. plan as if North Korea can strike today with an ICBM.